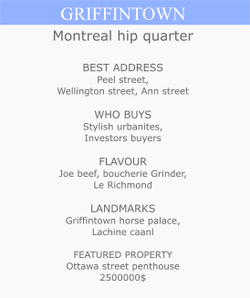 of Montreal have distinct neighbourhoods, each with their own features, buyer profiles and top addresses. 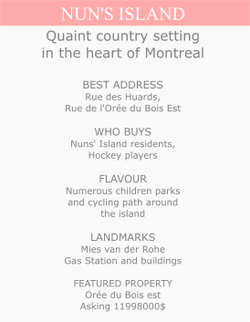 The true core of Nuns Island, 'Pointe-Sud' is the postcode en vogue for families with children looking for a home close to Downtown Montreal. Transformed into an expensive residential area since 2000, following construction of several condominiums buildings, Nuns' Island now is the campus for canadian telephone company BELL and attracts banks and restaurants that bring life to residents to the traditional pavements of Place du Commerce Village. neighbourhood quality and a sense of community which has few equals in Canada. 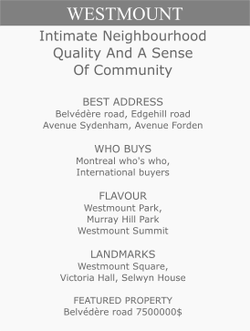 Westmount has five private schools and two colleges within an area of 4 square kilometers. Opulent architectural and landscape heritage, Westmount has the most beautiful houses. Homes on Belvédère road have panorama views of Montreal and the South Shore. Delimited by Bonaventure expressway to the east, Lachine canal to the south, boulevard Georges Vanier to the west and rue Notre-Dame to the north, Griffintown, the industrial birthplace of Canada that was home to a storied working-class Irish community, is transforming before our eyes. The vast area of 84 hectares is a giant construction site, with the constant cacophony of jackhammers, wrecking balls, bulldozers and cement trucks. It all started in 2004 with the development of Lowney condominiums on rue de l'inspecteur. The number of residents has tripled to 5000 today. Living in Griffintown today is living in the Plateau ten years ago. Daytime, nighttime, anytime, Montréal’s downtown is alive and kicking. Soaring skyscrapers clustered around Bell Center - the hockey forum, and heritage buildings intermingle with quaint boutiques in a compact and accessible downtown, making for a setting that is nothing less than spectacular. 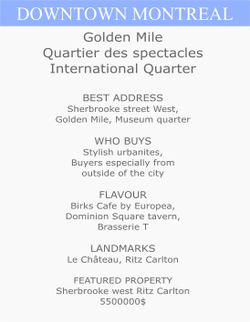 Sherbrooke Street Golden Square Mile, a 10-block stretch lined with high-end boutiques and world-class cultural institutions such as the Montréal Museum of Fine Arts and the McCord Museum, has been the biggest boom in condo construction. An urban space designed with pedestrian quality of life in mind, the newly-developed Quartier international is located just beside Chinatown and is home to the kaleidoscopic Palais des congrès and Place Jean-Paul Riopelle, which features the sculpture/fountain, La Joute, from the artist. A magnificent work that makes all who pass by stop and take a second look, its kinetic water sequence and dramatic ring of fire make for a fascinating public place.